“For everyone everywhere, literacy is a basic human right,” says the former UN Secretary-General, Kofi Annan, yet do African leaders know that 182 million adults can’t read and write, 48 million youths, between the ages of 15 and 24 are illiterate, 22%, that is 30 million primary aged children are not in school, according to UNESCO? Unfortunately, African children who have gained the opportunity to be in the classroom are continuously being lied to by their teachers. The teachers don't teach the children the truth, therefore, many African children lack behind in education. They are simply not clever, while African leaders have collaborated with foreign governments to cause more carnage and promote illiteracy in African schools. The fact that the truth about the origin of Aids was initially hidden from Africans led to the rapid spread of the disease in the continent. African leaders think it's an abomination to tell African children in schools that Aids and Ebola are biological weapons by the US government to reduce Africa's population and take control of our resources, yet it's not an abomination to accept the Aids and Ebola funds provided by foreign governments to control the diseases. 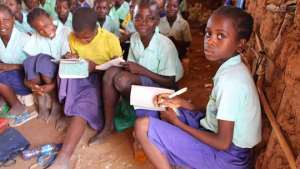 Decades after Aids was triggered in Africa as a biological weapon, the truth has never been spoken, this has caused much misery and affected Africa's education severely. African school children don't know where the disease originates, in this case, all that been thought about the disease at schools are false. Yet, those responsible, Europe, and the US governments, African leaders are protecting because of financial interest turn to mock African leaders, calling the continent a 'Shithole nation,' what is really wrong with African leaders? There are thousands of Africans in the Diaspora, whose children are in education in Europe and America. In the schools, the minds of our children are being polluted every day that it's normal for a man to marry a man and a woman to marry a woman. This has led to angry Muslim parents taking their children out of schools in Britain. Source: https://dailym.ai/2UCfqj6. The British and American governments think it's necessary to teach our children raised from Christian and Muslim homes that homosexuality is a good thing to do, nothing wrong about it, yet African leaders think allowing African school children to know the truth about the origins of Aids and Ebola is an abomination. Who is the stupid or the clever one, the African leaders or the British and the American governments? It will neither be the first nor the last to read that before African leaders will gain a little respect in both Africa and on international platforms, they must first think like human beings. I am not the only one that feels bitter about the way African leaders have collaborated with foreign governments to destroy Africa. They are inactive because their integrity has been exchanged for money but there is time for everything. Since the world is rapidly changing, our children will definitely grow up to know the truth and find out how they have been deceived and betrayed by their so-called African leaders like Judas selling Jesus for thirty pieces of silver. African leaders continue enjoying money from Aids and Ebola projects in Africa, provided by foreign criminals, while our resources are opened for looters, yet our children are in roofless, classrooms without tables and chairs. African leaders read about their sins and insults, yet pretend they don't know what is going on. The day they will care with sweat even in fully air-conditioned offices will soon come.